Is there a better alternative to FileWard? Is FileWard really the best app in Security category? Will FileWard work good on macOS 10.13.4? 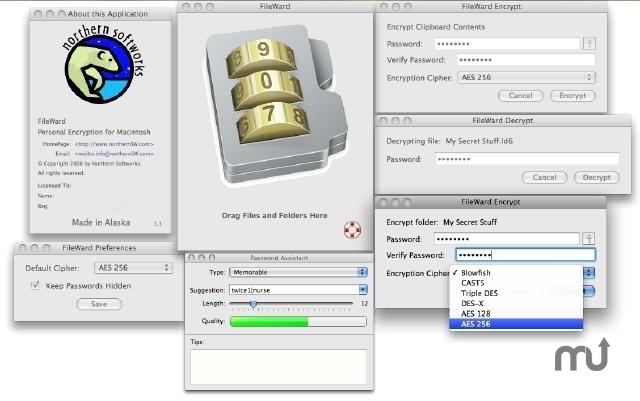 FileWard is a handy tool designed to bring high-strength data encryption to Mac users. FileWard uses the cryptography libraries of OpenSSL to make six industrial strength encryption ciphers available in an easy-to-use drag-and-drop application. FileWard brings convenient high-strength encryption to the clipboard, allowing you to encrypt any clipboard contents including text, pictures, spreadsheets, whatever! In short, if you can copy it to the clipboard, FileWard can encrypt it. FileWard even lets you encrypt binary files directly to the clipboard. With FileWard, state-of-the-art encryption of files and data is finally made simple.